A Bag Net in a Rough Sea. Two Salmon in the Net. A Boy Unlacing Top of Net to Get the Fish Out. Boy Lifting a Twenty Nine Pounder into a Basket. Big Game Trophies in the Royal Artillery Mess at Woolwich - Pamir or Marco Polo-s Argali - Lechwe - Reedbuck - Markhor x2 - Impala - Sable Antelope - Goral - Asiatic Ibex - Canadian Black Tail. Corsette a Rough St Bernard. Oakworth Osiris a Smooth St Bernard. The Hall - North West Corner with Paintings Crests, etc. The Hall - A Screen. Henry VIII Panelling and Queen Anne Cabinet in the Hall. The Hall - A Settle Behind the Screen. The Dining Room - Fireplace with Royal Arms Abve. The Hall - Ornate Roof with Heraldic Beasts etc. Fireplace in a Bedroom. With Large Heraldic Panel. Georgian Cake Baskets and Choice Miel Examples of Decorative Arts. The Hall Doorway and Windows. Gardening - The Snowdrop Windflower Anemone Sylvestris. Women and Children Crushing Olives in Palestine - From J. S.
Last Year at Murren - Two Children on a Sledge. A Happy Prisoner - A Golden Plover Nursed Back Reive to Health After Being Caught in Aerial Wire - From Charles Reid. Kirkdale Church Yorkshire - A Saxon Inscription - From A. Pilkington. c.keenlyside. Deerhurst Church in Gloucestershire, Recently Renovated - From F. S. A.. The Interior of Deerhurst Church. Garden Side of the House. Whiteleys Winter Furniture Sale of Queens Rd London. The Universal Coffee Maker from Lander-s, Frary and Clark. The Toast is Britain - by Fred Roe RI - A Striking New Nelson Picture. advert for Wrights Coal Tar Soap. This is an original but USED magazine not a scan and not a later re-print. If there is a particular date you require in regards to this item eg. for a birthday or anniversary etc please ask. The four digit number in brackets in title is for my ref only. Twenty pages (40 sides). It measures 360 x 235 mm (14 x 9.25 inches ). There is no advertising cover, but the front cover is present. This issue has had the Property For Sale Supplement, advertising pages, and other pages removed. The spine has been reinforced/repaired at some time. The inside pages have binding marks throughout. There is a little age yellowing. The original advertising cover and supplement pages have been removed, approx five pages. This item will be packaged in a tube unless otherwise requested. Quotation or speech marks in the text signifies the content in my words and not necessarily what is written on the original page. PLEASE NOTE: I cannot guarantee that the issue is complete 'as published' - but what I have described above IS present. There are pages missing as described above but everything listed above is present, so if you are looking for something in particular in this issue PLEASE ASK. 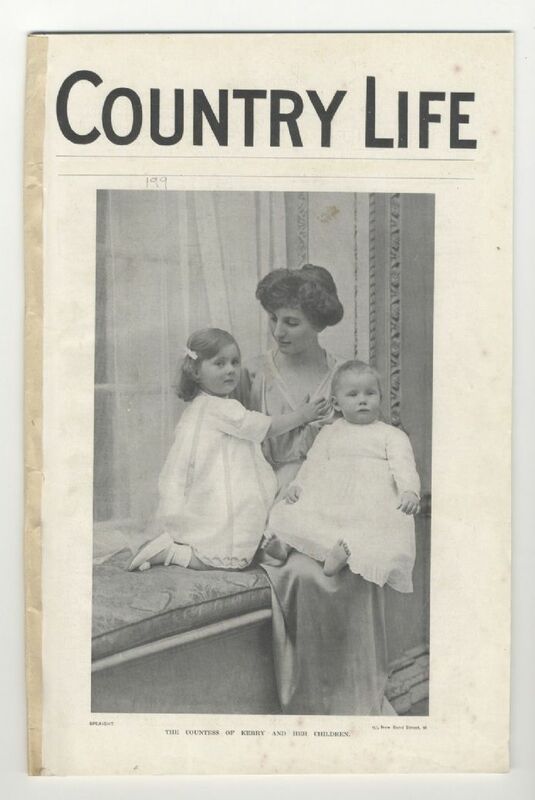 The process of the page numbering in The Country Life issues continue from the previous issue therefore do not start at number 1."Info." in the description is my research, although relevant to the accompanying image or article, is not necessarily in the text.